Start by making the crust: preheat the oven to 180°C/350°F. Butter four 1-cup (240ml) capacity mini cake pans (mine have removable bottoms). Mix graham cracker crumbs and sugar in processor. Add melted butter; process until crumbs are evenly moistened. Press crumb mixture onto bottom (not sides) of prepared pans. Place pans onto a baking sheet and bake until crust is set and deep golden, 6-8 minutes. Cool crust while making filling. Maintain oven temperature. Now, the filling: place the cream cheese, sugar, vanilla seeds, eggs and sour cream in the bowl of a food processor and process until smooth. Divide the filling evenly among pans. Sprinkle the filling with the blueberries. Bake until set around edges, and center moves slightly when pan is gently shaken, 25-30 minutes. Cool completely over a wire rack then refrigerate uncovered for 3-4 hour or overnight. Carefully unmold and serve. I love individual desserts... They are so much more special. These look great. I like when a recipe turns into a different one. Wow how'd you get these so perfect looking? No sinking or cracking! Gorgeous! 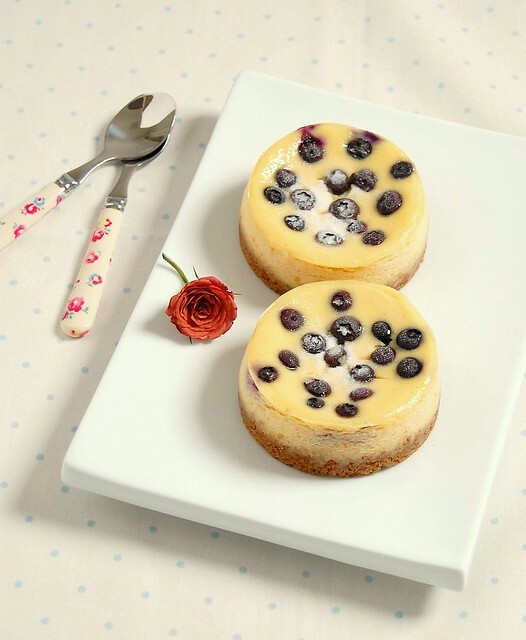 Lovely cheesecakes, congratulations for the picture ! I always find small desserts so lovely, but I also think the workload and effort to make it instead of just one, a big one, But afeter looking your pictures, I confirm that making individuals looks better. I never knew how to make a sub for sour cream! Thank you!!!!! Can you not tell any difference? Cute looking damn adorable cheesecakes..
Ilka, I live in Brazil, too. I use Philadelphia cream cheese (I do not know if requeijão would work). I'm looking forward a dessert for new year's eve... these cheese cakes looks great!